Gainesville, Georgia (population 36,000) impressed any number of people as a “best” boating community in 1996 when many of the Olympic canoeing and rowing events were held near here on Lake Lanier. The combination of a small city on a lake has led many boaters here in quest of the perfect living environment. Located in northern Georgia with a mild four season climate, Gainesville is the gateway to the excellent recreational opportunities of the nearby Appalachian Mountain forests. The downtown features a number of attractive art deco style government buildings built after a 1936 tornado. 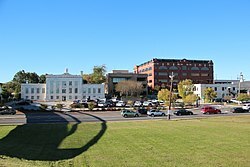 Gainesville is the county seat of Hall County. Many residents came here as workers or executives in large poultry industry: Gainesville is known as the “chicken capital of the world”. Others live here and commute to Atlanta, 54 miles away.